Travel to Guinea and participate in high-level drum, balafon and dance classes with Abou Sylla and local teachers. Abou Sylla is an international performer from a long line of griots (traditional musicians) in Guinea. He was a member of Les Ballets Africains, the prestigious national dance company of Guinea, for six years during which he played not one, but five instruments — the balafon, djembe, krin, doundoun and bote. 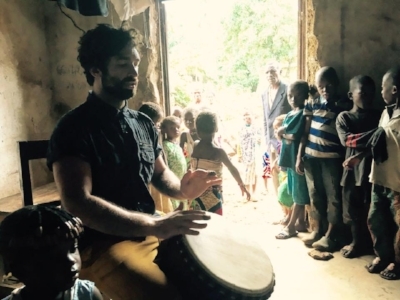 Abou is based out of Austin, Texas and is dedicated to sharing his passion for African music and culture not only through performance, teaching, choreography and instrument-building, but also through enriching travel experiences with students. This region of West Africa is home to traditional instruments such as the djembe, doundoun, and balafon, as well as many rhythms, songs and dances. As a student traveling with traditional musicians and artists in Guinea, you will have opportunity to experience the music, dance and instruments in their traditional context, and to learn from masters who not only have amazing knowledge and skills passed down through generations, but also have deep connections to the region’s musical history. This trip will provide you with the opportunity to journey into the heart of Sousou culture — visiting Conakry, as well as various villages such as Bouramaya, Kenende, Fria and others — to discover the rhythms and dances of the region. In addition to learning about the fascinating musical traditions of the region, you will meet and make connections with local Guineans throughout your stay. Guinea is a country of exceedingly friendly and hospitable people who are eager to share their vibrant culture and lifestyle with visitors. Opportunities to explore many facets of Guinean life – from visiting bustling markets to experiencing Conakry’s nightlife to having clothes tailor-made for you! Classes are taught five days of the week (Monday – Friday), except during travel days. Classes are geared to intermediate to advanced students, with an emphasis on style and technique. We will arrange for beginner classes if necessary. We will be dancing for two hours and drumming for two hours each class day. Student drummers will play for all dance classes and will be accompanied by a master artist. Conakry will serve as our home base. We will take side trips to various villages. Air travel to and from Guinea is NOT INCLUDED in trip cost. You are fully responsible for arranging and purchasing your own roundtrip ticket to Guinea. All required travel paperwork (passport, visa, etc. ), vaccinations/medication, and insurance are NOT INCLUDED in trip cost. You are fully responsible for obtaining and paying for all required travel paperwork, vaccinations/medication, and insurance. Visa must be obtained in advance of departure. Information about required forms, documents, photos, vaccinations and fees required for obtaining a visa may be obtained by contacting the Embassy of the Republic of Guinea, 2112 Leroy Pl, NW, Washington, DC 20008. (202) 986-4300, (202) 986-4500. Anti-malarial treatment and additional vaccinations are highly recommended for travel to West Africa. The CDC’s up-to-date recommendations and information may be found on their website. All tour participants must obtain personal travel/health insurance for the tour. Air transportation is not included in the trip fee. You must arrange for and purchase your own roundtrip ticket to Guinea. Lodging is included and will vary based on locale. In Conakry, lodging will be dormitory-style. In villages, lodging will be in traditional huts and dwellings. In some cases there will be no access to western toilets or showers. Tents and/or mosquito netting are recommended. Three meals a day will be provided in Conakry and in villages. Vegetarians and special dietary needs can be accommodated with advance notice. The official language of Guinea is French, but many African languages are spoken widely, including Sousou, Malinke and Fula. French experience is not required but it is highly recommended that you bring a basic French phrase book. Visiting Guinea provides a great opportunity to learn (or brush up on) your French and to learn some words and phrases in African languages. Loose, light clothing (microfiber recommended), sturdy walking shoes/sandals and a good hat are highly recommended. Mosquito repellent and sunscreen are necessary – pack them! 2-3 week programs and 1 month programs available during this period. Initial Payment: $500.00 USD is required at time of registration. Final Payment: Remaining amount due no later than three weeks prior to scheduled departure date. Payment Methods: Checks or money orders may be made payable to Sylla Music. US funds only. Cancellation Policy: Cancellations made more than four (4) weeks in advance of trip start date - a $200.00 USD cancellation fee will be charged. Cancellations made less than four (4) weeks in advance of trip start date - 80% of full registration fee will be refunded. “Traveling to Guinea with Abou was one of the best experiences of my life personally and as a musician. This was my first trip to Guinea and I instantly fell in love with Conakry and everywhere else we visited. This trip is perfect for anyone looking to fully immerse themselves in culture and be challenged at such a rewarding level. After only few days we already felt like we were part of Abou's family and the community we stayed in. There is no better choice for a fully personalized experience that will allow you to study exactly what you want. Abou and all of the staff that work with him are wonderful teachers and great people. They are all such passionate artists ready to share their music with anyone. The memories I made on this trip will last a lifetime. The second I left I was ready to go back with music in my heart. I can't recommend this trip enough!” — Dana T.
"I traveled with Abou to Guinea in January of 2014. For me, the trip was about much more than studying West African music and dance — although I did have many wonderful teachers and classes. I had the opportunity to see much of Guinean life that students on other trips may not see, including daily life in the Madina marketplace, impromptu invitations to dundunbas and weddings, and a trip to meet Abou's family in the villages outside of Conakry. Everywhere I felt completely safe and looked after. Abou's family is so kind and generous and it was a tremendous honor to be a part of their community for a few weeks. I wouldn't hesitate to travel with Abou again. He took wonderful care of all of us, made sure we had everything we needed, and introduced us to more aspects of life in Guinea that I ever expected to encounter. It was truly the trip of a lifetime.” — Susan S.
“My trip to Guinea was one of the most enriching journeys of my life. It deepened my awareness for West African rhythm and dance beyond measure. Abou is a very attentive host and made sure that our needs were met at all times. His family embraced us and treated us like royalty, always with a smile. I felt like part of the family. Abou took us out to see some jaw dropping-shows of dancing, drumming and acrobatics. I’ve never seen anything quite like it. You have to be there to experience something like that! I reflect on my trip to Guinea often. There is a resonance deep in my cells that recorded all that I experienced there, it will always be with me and I will always treasure it. One day I will return…” — Kimberly S.
"I went on a trip with Abou in January 2014 and it was a wonderful experience. Abou looked after us really well and never grew tired of answering our questions. As well as dance and drum classes we also travelled to villages and danced for all the community. Visited markets including the huge one in Conakry where the vast array of spectacular printed cloth was almost too much for the senses but so vibrant and vivid. Abou took us to see local ballet troupes practicing and we were priviledged to see spectacular live performances and also watched and danced at two dundunbas. Some of the experiences we had were spontaneous such as joining in with a wedding so we had to expect the unexpected and be prepared for anything. Abou is very calm but organized and very caring. My favorite part was getting out of Conakry to the villages and travelling from one village to the next with Abou and the other drummers in the back announcing our presence with their drumming and all the people we passed waving and cheering it was so joyous and wonderful. I have really great memories from that trip and would like to go back and explore Guinea a bit more in the future. When I'm faced with difficulty in my life I always remember Abou and what I learned from him and others on that trip and everything gets better. " — Carol W.